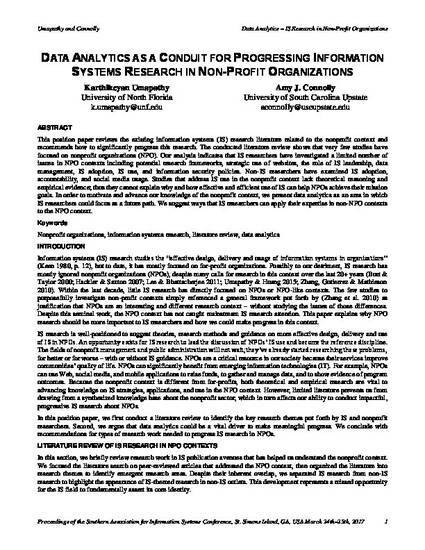 This position paper reviews the existing information systems (IS) research literature related to the nonprofit context and recommends how to significantly progress this research. The conducted literature review shows that very few studies have focused on nonprofit organizations (NPO). Our analysis indicates that IS researchers have investigated a limited number of issues in NPO contexts including potential research frameworks, strategic use of websites, the role of IS leadership, data management, IS adoption, IS use, and information security policies. Non-IS researchers have examined IS adoption, accountability, and social media usage. Studies that address IS use in the nonprofit context lack theoretical reasoning and empirical evidence; thus they cannot explain why and how effective and efficient use of IS can help NPOs achieve their mission goals. In order to motivate and advance our knowledge of the nonprofit context, we present data analytics as an area in which IS researchers could focus as a future path. We suggest ways that IS researchers can apply their expertise in non-NPO contexts to the NPO context. Umapathy, K. and Connolly, J. A. (2017). Data Analytics as a Conduit for Progressing Information Systems Research in Nonprofit Organizations. Proceedings of the Southern Association for Information Systems (SAIS), St. Simons Island, GA, USA.